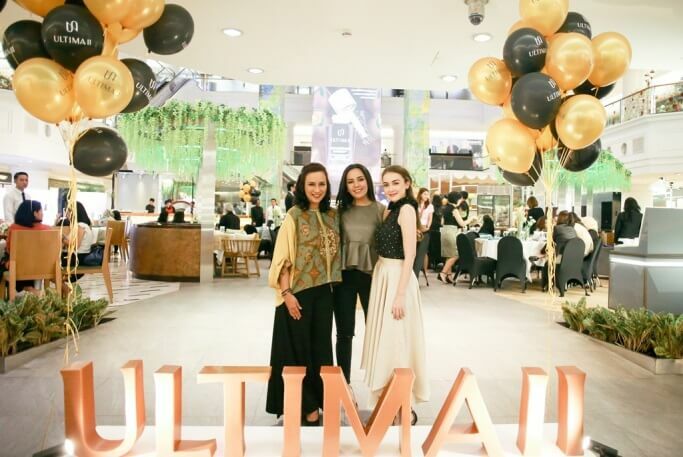 ULTIMA II reaffirmed its logo and essence as a cosmetic and skincare brand, The Collagen Expert, to the public through a rebranding event by presenting celebrities from three different generations on 19 April 2018. They were Angel Pieters representing ladies in their twenties, Rianti Catwright for the ladies in thirties, and Shahnaz Haque for the forties. In addition, ULTIMA II also invited an expert in dermatology, dr. Rininta Christabella, who shared her opinion from medical perspective about collagen for women of all ages. ULTIMA II also had media outlets, business partners, Key Opinion Leaders (KOL) representing various market segments such as the socialites, celebrities and beauty influencers, as guests of the event. The change of appearance and logo of ULTIMA II which is modern yet classic and timeless has been the momentum for ULTIMA II to regenerate its market segments as well as improving ULTIMA II brand image as a premium brand. On the event titled Collagen Revolution, ULTIMA II as The Collagen Expert also introduced collagen skincare for all ages. Having Collagen Revolution as the theme, ULTIMA II reintroduced the series of collagen skincare for different age segments, such as Collagen Hydrating Resource series, Procollagen Extrema Advance Activator, Procollagen Extrema series, and Procollagen Supreme Caviar series. In rememberance of Kartini Day, not only did ULTIMA II invite an inspiring Brand Ambassador, but also an inspiring career woman Anne Ridwan, the Director of Ogilvy & Mather Indonesia was requested to deliver the opening speech, as a commitment of ULTIMA II to keep inspiring women to have Strength in Beauty. The event which was held at La Moda, Plaza Indonesia, was also enlivened with skin consultation by The Collagen Expert, video campaign #UltimaIIStartsNow, and closed by the performance of Lala Karmela.